VMI extruder gear pump systems are used in different types of extrusion applications, where precision of the extrusion product is a major requirement. 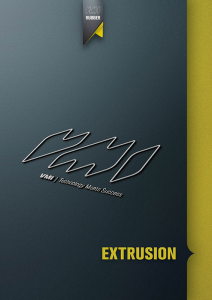 VMI offers various applications such as wire coating, silicone tubing, profile extrusion, blending and final mixing. Global experience and personal service add up to high quality and profits, and will reduce your labor costs. Manufacturing applications and flexible solutions for your rubber processing. A higher quality output while saving on investments and energy. Continuous and high accurate tread extrusion with a high flexibility. High pressure straining improving your compound quality. High performance continuous preformers delivering high quality products. High precision continuous side feeding of rubber. Rubber strip winding with high accuracy and high pressure output. Excellent control over the output quality.